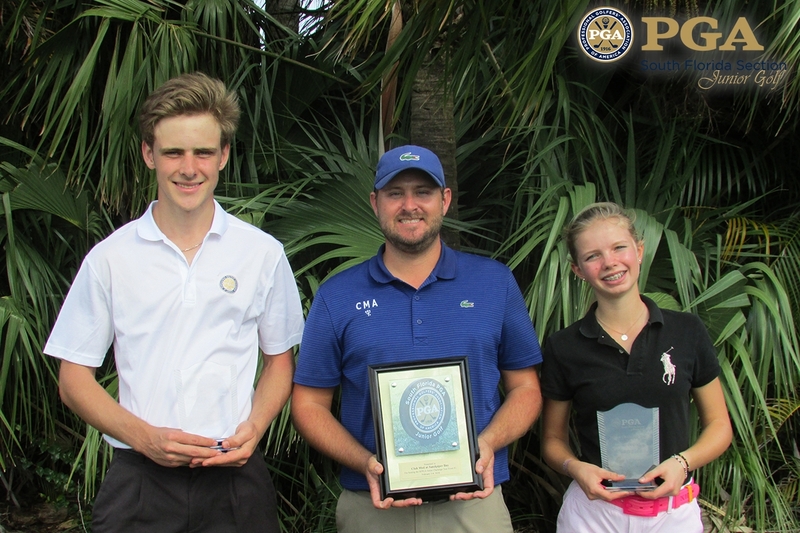 December 3rd 2017 - ATLANTIS, Fla. – This weekend, the South Florida PGA Junior Tour Championship presented by The Honda Classic was held on the Hills Course at Jonathan’s Landing Golf Club at Old Trail in Jupiter, FL. The invitation only field consisting of South Florida’s top junior golfers did not disappoint. Nicklas Staub of Boynton Beach put together an incredible performance this weekend. Staub opened up round one with a 4-under-par 67 to take the early lead in the boy’s division. Staub put together a solid final round even-par 71 to capture the 2017 Junior Tour Championship boy’s division by four strokes. Fernando Castillo of Wellington took home the boy’s 13-15 age division after rounds of 74-70. James Nieporte of Boca Raton took home the boy’s 16-18 age division after rounds of 68-74. Nicole Cee of Port St. Lucie was named the Honda Classic Most Improved player at the 2016 Junior Tour Championship. A year later everything came full circle as Cee capture the 2017 Junior Tour Championship girl’s title this weekend. Cee opened up round one with a 1-over-par 72 to take the early lead in the girl’s division. Cee managed to fend off Laura Edmonds of Weston who fired a final round 1-under-par 70. This is Cee’s first Junior Major Championship of her career. Hina Matsui of Port St. Lucie took home the girl’s 13-15 age division after rounds of 77-75, while Edmons took home the girl’s 16-18 age division after rounds of 76-70. Alex Heard of Boca Raton captured the boy’s 11-12 age division this weekend. Heard entered the final round two strokes back of NaShawn Tyson of North Palm Beach. Heard fired a back-9 4-under-par 32 to surge past Tyson and capture the title. Gabriela Sierra of Weston took home another victory in the girl’s 11-12 age division after rounds of 82-78. The South Florida PGA Junior Tour is proudly presented by The Honda Classic and supported by Allianz Championship, Antigua, Club Chef, Don Law Golf Academy, Natalie’s Orchid Island Juice Company, Palm Beach County Sports Commission, Pukka, The Men’s Fun Group at Mirasol, Titleist and Skimp.